Can you believe it? Our little girl Mathilde is now two months old. Mathilde has grown so much, both physically and developmentally, in the last month. She's definitely losing that newborn look. Isn't it amazing just how fast babies grow and learn new things? Her little arms and legs are getting chubbier (there are almost rolls) and she's finally big enough to start wearing her cloth diapers. We're getting lots of smiles now and plenty of happy noises. Sometimes even noises that sound like little giggles. Plus we can now predictably make Mathilde smile. She loves looking at faces and having people talk or sing to her. Squeezing her cheeks and touching her chin usually brings on a smile. Poking my tongue out at Mathilde almost always brings on smiles too. When she's not poking her tongue out back at me that is! This is something I've been doing with Mathilde from day one. Back when Ava was a few months old I attended a parent and baby education group. One of the things that really stood out that they taught us was just how quickly newborns can learn to mimic simple actions, like poking out your tongue. I made sure to try this out with Lola when she was born and sure enough within the first few weeks she was reliably poking her tongue out after I poked mine out. And now Mathilde does the same. It's such a nice little connection to have with a baby - although I'm sure I look crazy when we do this in public! Watching cars out of our windows is one of Mathilde's favourite things. If she's crying (but not for any of the obvious reasons like hunger or needing a diaper change) I take her to the window and we look out at the traffic below. Within seconds the crying stops and she calms down. It's amazing how well this works - let's hope I haven't jinxed it! Mathilde especially likes to watch cars at night. All those lights zooming past. In fact, she may like looking at lights even more than she likes watching the traffic. Want to know how I got her to smile in all these photos? She was looking at the flash! Don't worry, it wasn't pointed at her. Mathilde loves her big sisters who dote on her endlessly. Both Ava and Lola love giving Mathilde cuddles and they're both quick to jump in and help out when she drops her pacifier or needs someone to bounce her bouncer. They're also fond of photobombing shots of Mathilde! Not surprisingly, neither of them is keen to help out with diaper changes just yet though! Mathilde is quite a strong little girl and loves "standing" up. At every opportunity she gets she loves to stretch her legs out and plant her little feet down. It's amazing just how little support she needs from me to stay upright. When she had her last check up at 7 weeks Mathilde's doctor was amazed at how strong she is. At one point Mathilde was on her belly with her head down, bum up and little legs moving frantically and she actually managed to move at least 30cms across the bench she was on. The doctor was just as surprised as I was. In fact she said that Mathilde is probably the strongest baby for her age that she's ever seen. Maybe I've got a future Olympic weight lifter on my hands! Mathilde is starting to interact with toys more and more. She reaches out to the toys hanging from her bouncer chair, tries to reach up to the mobile hanging over her change table and has started grabbing and clutching her Sophie Giraffe when she's in the stroller. And every now and then she succeeds at putting her pacifier back in her mouth when she drops it. If only she could keep it in her mouth in the first place! I'm really lucky that Mathilde is such a calm baby most of the time. Of course, when she's upset or wants something she'll let you know all about it. She definitely inherited Kim's vocal chords just like her big sisters! For the most part though she's pretty chilled out, especially when she's cuddled up against me in her wrap. She'll sleep for hours and hours on end when she's wrapped up snug against me. It certainly made things easy when we were out playing tourist with my parents recently (lots more posts on our adventures to come). 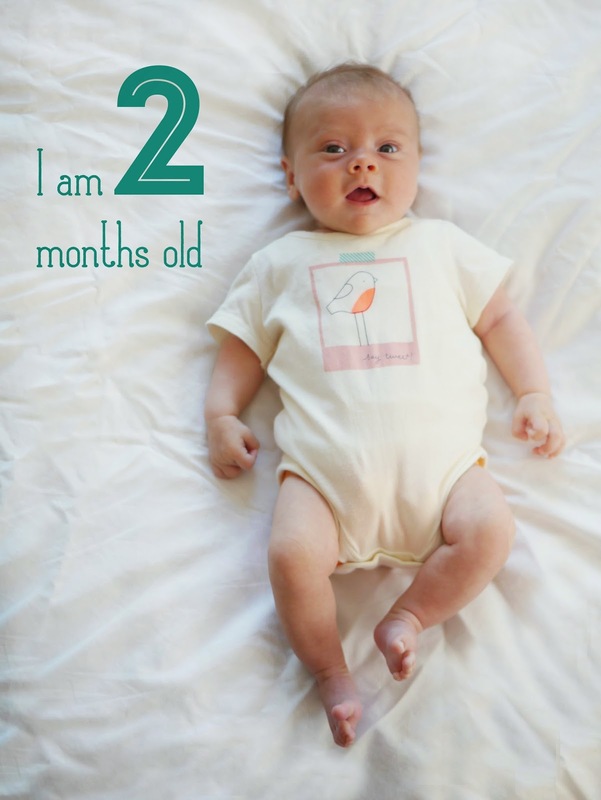 Happy two month birthday Mathilde!